The Afinia H480 is hardly remarkable by any stretch of the imagination but as it is targeted towards casual printing and more prototyping than anything else it is easy to see why it’s a little lack luster. This is a very work horse style machine, able to print and do just about only that, no frills or any fancy features of any kind which for some is all they’d need. best for people who want to experience 3D print but not so much so that they’re tearing their hair out over trying to learn the software that came with the machine or having to find a software suite by themselves and hope it’s compatible with their setup. While some of us out here revel in figuring out how to make machines run optimally ,and that’s okay, it’s far from a good way to have your customers experience your product. Afinia made waves back in 2012 by being featured in Make Magazine awarded the “Best Overall Experience” with “Easiest Setup” and “Easiest To Use” in their 2012 3D Printing Buyer’s Guide. With the praise of theses earlier days does it really stand the test of time now with so many options on the market, or is it really showing it’s age next to these young guns who have seen innovation after innovation? Final Analysis – Is it a Good Buy? 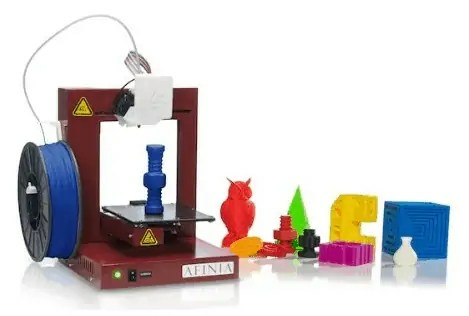 Afinia is not a new name and thusly are quite different to much of what newer printing companies have been: crowdfunding to test the waters and letting potential customers buy products before products have even started being manufactured. While on the surface this appears to benefit everyone as it’s usually a discounted price for those early funders, it’s becoming more and more of a cash grab offering up concept art and hopeful words and the companies disappearing after full funding is achieved and they get their money. Afinia has been around for twenty years showing that they can deliver products and develop business strategies as an actual company for decades. With all of this business minded behavior; they’ve had success in the fields of copying and imaging for CD-ROM, and other formats including flash drives, with their parent company Microboards Technology. Not exactly what you look for in the ways of developers of 3D printing manufacturing, though with their success they certainly proved themselves to be a very versatile business with their second generation of this printer premiering sometime in June 2015 that looks just as promising as the current model was at release but that’s another article altogether. Adding to the downsides of the printer is a smaller than usual build area that severely limits the size of objects you can print and will have to make you rethink some designs into multiple pieces that can be fitted together. The software for the printer is also very utilitarian but not impossibly difficult to work with and would allow people with minimal computer experience only a couple of minutes working out things with the UI. So in a way it’s oddly user friendly; when you’ve used it once you should have everything worked out for future use. They’ve also used a material I’ve hardly even heard of for the build surface a mixture of glass and epoxy that’s perforated for better adhesion when laying the initial lines of the print because the plastic flowing into the miniscule pockets and rows in the material of the bed. The printer really is an odd mix of the bog standard and some interesting trends I’ve not heard being implemented in other solutions at similar price points, like multi color prints in the software by allowing the printer to pause and manually change filaments for different streaks of color in the surface of the print, sadly as you’d expect this requires paying attention to the print all they way through and is limited to only horizontal stripes. Another odd features is that most of the indications from the machines are done audibly with a beeping to represent different statuses, the first Beep indicates that the files have been loaded into the onboard memory so you can disconnect the usb cable for the printer and it should print autonomously, The second beep indicates the extruder has reached temperature, followed by that are 3 consecutive beeps alerting you to the print starting, The last of the beeps will be five in a row signalling the print is complete. While this is helpful because you don’t have to be in the room to tell what’s going on to an extent but is extremely tedious when you just want to print something as it’s loud and almost obnoxious to a point. 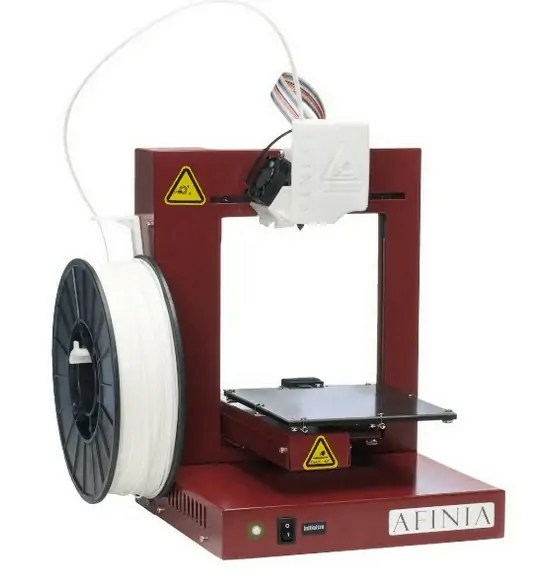 If you like simplicity and are willing to put up with a few minor drawbacks to just get yourself printing this is a suitable option, if you can afford a couple hundred dollars more I’d recommend waiting to see what the Afinia H800 has to offer. if you simply can’t wait to get a printer I’d suggest looking elsewhere for something either a little cheaper with the same simple construction in mind but a little more work on the user’s part like a Printrbot or bite the bullet and pay more for a reliable and high quality solution with more functionality. Hopefully a new start for this platform is all it takes for Affinia to push their way into being a household name, maybe even bringing more eccentric designs and features to the table that we just never realize were viable, based on this platform they’re certainly not afraid of stepping into new territory and breaking the mold though I suppose you’d have to be to go from data copying and label making to a whole new dimension, this is how they’ve stayed relevant all these years and I see Afinia only getting bigger for the next couple years. I don’t know if I’d recommend this product to anyone who can afford better options, but it’s such an oddball compared to more modern 3D printers I would give it merit for that alone. It’s a good step into 3D printing with it’s reliability if not a little too loose tolerances when it comes to accuracy where warping occurs at very fine details unlike most new printers they don’t try to achieve finished product levels of detail. 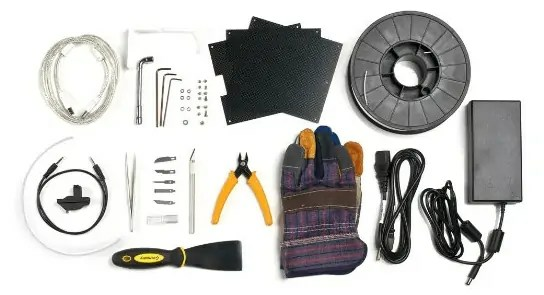 This is your standard garage printer that would go nicely with an old laptop to run it and used to print off replacement parts for things around the house, not to say that’s a bad thing just to keep that in mind when comparing it to other machines. Bottom Line: So that is just about all there is to be said about this machine it’s interesting and brings some different things to the picture, overall all quality leave a little to be desired but is ok for what it is, great for beginners and people testing the waters. No place with enthusiasts and people hoping for the easiest time with a printer.